A new one-credit plant propagation course, Natural Resources Management 150, offered at the University of Alaska Fairbanks drew a diverse array of green-thumbed individuals for fall semester. For spring semester, Professor Pat Holloway of the School of Natural Resources and Extension is offering Natural Resources Management 151 through distance delivery. The one-credit course will be available to students on the timeframe that works best for them. NRM 150 presented a broad view of seeds, how they go dormant and how to get them out of dormancy. “One student told me she is never going to look at a tree or plant the same way again,” Holloway said. NRM 151 will focus on the principles and practices of plant propagation useful in horticulture, botany, forestry, agronomy, revegetation, land reclamation projects and plant research. 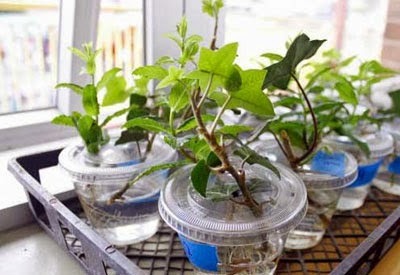 The course will cover methods of vegetative propagation, including cuttings, layering, grafting, bulb, corm and tuber propagation and micro propagation through tissue culture. While the emphasis is on Alaska native plants, “we go around the world,” Holloway said. Lectures and assigned activities explore the fundamental basis for reproduction of plants. Students will become familiar with the theory and practice of plant vegetative propagation for entry level work in a commercial greenhouse or fields and for home garden use. Along with Holloway’s lectures, students will watch videos, take weekly quizzes and write an essay. Anyone interested should have a basic understanding of high school biology. Students who complete both courses are eligible to take an intensive three-day, hands-on workshop in May. For more information, email Professor Holloway; for registration information, contact UAF eLearning at 907-479-3444 or uaf-elearning@alaska.edu.